I need to implement a save/load system, which I don’t have yet. 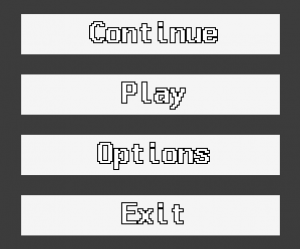 In short, there are three times a game is saved or loaded: save during gameplay, save during menus, load during menus (load during gameplay is not valid). It’s more complex than that and I’ll get to that, but these are the key points (or rather transitions between these) where saving and loaded is needed. There’s not much to save at the moment, but I do already have player’s inventory and upgrades. Firstly, I am making those as new systems that are responsible for storing player’s inventory and upgrades and passing them onto the in-game world mob when the game starts. These need to be stored separately from any world or player entities so they don’t get lost between runs, because the player doesn’t “exist” unless there is a world. 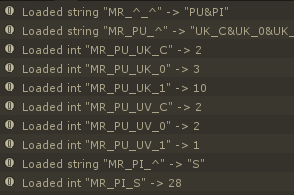 This is my scrap and my upgrade-level data encoded into individual fields, split by system, with some meta information. I can easily extend this and add new save data — the systems wanting to load or save simply need to read or write their data to the save container, which gets processed independently. This is very important for any post-launch updates I will do where I cannot lose user’s data. I need every system to be backwards-compatible and be able to walk through previous version data and update it to new format, add missing, remove deprecated, or whatever actions it needs to do. 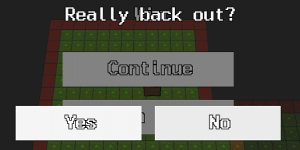 Now, I can call the loading at the start of the game and when the world starts, inventory and upgrade systems will tell the player mob who they are and the player mob can then use them normally, except their changes will actually get saved. 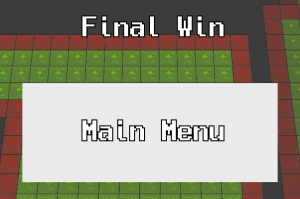 Now, there are four things that can happen in the level — the player wins, loses (dies), abandons (leaves), or crashes (hard-quits). None of these are straight-forward, so let’s go through and implement them one at a time. Now, I don’t really need special considerations for the game crashing mid-game just yet. 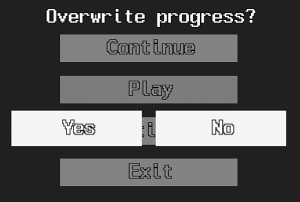 I will have the progression stuff when I make level transitions and progress, but I’ll get to that in a second. All of this is very finicky as there are so many moving parts. World, UI, game pipeline. Thankfully, everything has its own well-defined pipeline, so it’s a matter of carefully arranging the right events at the right times, like opening panels, saving/loading, changing game states, removing world, removing player, notifying things about world or player changes… And we’re not done yet. This numbers gets increased in they win the level. It gets reset to no game if they lose. And it gets untouched if they abandon (my permadeath is optional, so I don’t really care if they cheese something they can just uncheck when starting a run). And then fight some UI pipeline battles to get the whole UI pipeline working properly with loading screens and correct calls to stop and start the game properly. 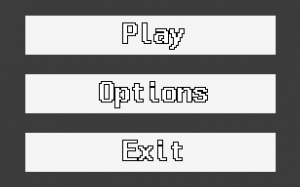 …which just looks like my old main menu. And I think that about covers the main parts of saving and using this for level progression pipeline. A very important, often neglected part. But now I have this and it feels great for the “completeness” of the game.